Baby wipes and diapers – the two tend to go hand-in-hand. But according to a study published in the journal of Pediatrics, the former could be the cause of a red, itchy, scaly rash in some children. Put simply, they could be causing an allergic reaction. This surprising information comes from Dr. Mary Wu Chang, an associate professor of dermatology and pediatrics at the University of Connecticut School of Medicine. She’d been faced with six different children with mysterious rashes at the UConn Health Center. All of them were eventually linked back to methylisothiazolinone (MI), an ingredient found in baby wipes and other household products. Chang’s first patient was an 8-year-old girl. The child had a red, scaly rash around her mouth and on her bottom. The rash had been treated with steroids and antibiotics, which did work for a little while, but the rash always came back. After taking a look at the girl’s medical history, Chang started to wonder if the girl might be having an allergic reaction. Sure enough, the mother said she’d been using baby wipes. Pieces of the puzzle starting coming together when Chang recalled a report that she’d read about a Belgian man suffering from a reaction to MI. Chang decided it would be worth checking for, and interestingly enough, allergy testing revealed that the little girl was having a reaction to the MI found in the baby wipes. “I think it may be more common than people realize,” Wang said. The next five patients, all children treated at the UConn Health Center over the next 22 months, would indicate that Chang is probably correct. Each and every one of them showed up at the clinic with a similar rash. In each instance, the mothers had been told to stop using the wipes. 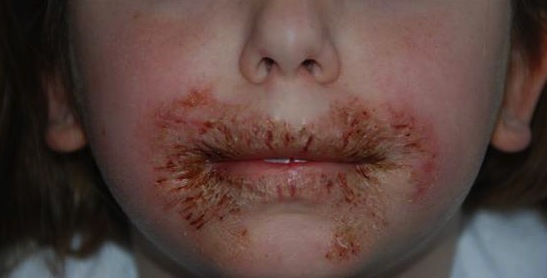 Once the use of wipes ceased, the rashes went away. Chang says she isn’t prepared to tell parents to stop using wipes entirely. However, she does suggest that parents consider using alternative cleaning cloths, at least while at home – especially if there is any sign of an itchy, red or scaly rash on the child. Dr. Robin Gehris, a clinical associate professor of dermatology and chief of pediatric dermatology surgery at the University of Pittsburgh Medical Center, says she’s also seen more reactions to baby wipes. She believes it is possible that the reactions are due to the fivefold increase of MI in baby wipes. Gehris is also concerned that we might be sensitizing an entire generation to MI – not just because of baby wipes, but also because the chemical is popping up in all kinds of household products, including lotions, make-up and shampoo. She also gave some suggestions about how parents can reduce MI exposure in their very young children. Having five children, some severe skin sensitivities, I can definitely relate to the challenges of not using baby wipes all the time. While we did keep them around for on-the-go emergencies, we mostly stuck with moist paper towels from restrooms. At home, we simply used damp washcloths. Those used when changing diapers were automatically tossed in the cloth diaper container. Although it seemed inconvenient at first, it became just another part of our routine after a while. We realized that it was definitely more economical than purchasing wipes all the time, but most of all, we had happy kids that were (most of the time) rash-free. Ciara Shows Off Her Growing Belly on The View!